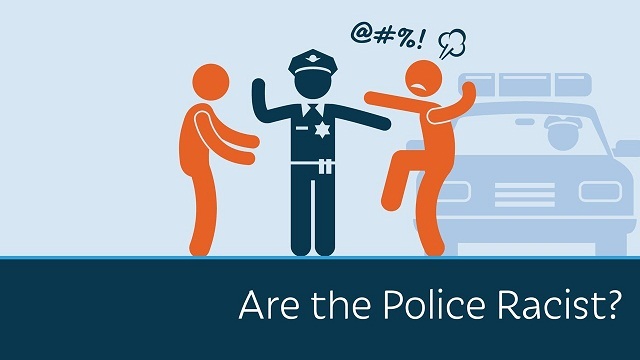 VIDEO: Are The Police Racist? Do they disproportionately shoot African-Americans? Are incidents in places like Ferguson and Baltimore evidence of systemic discrimination? Heather Mac Donald, a scholar at the Manhattan Institute, explains. Not to groups like Black Lives Matter. That’s tragic for many reasons, not the least of which is that black lives are being lost as a result. A recent “deadly force” study by Washington State University researcher Lois James found that police officers were LESS likely to shoot unarmed black suspects than unarmed white or Hispanic ones in simulated threat scenarios. Harvard economics professor Roland Fryer analyzed more than 1,000 officer-involved shootings across the country. He concluded that there is ZERO evidence of racial bias in police shootings. In Houston, he found that blacks were 24% LESS likely than whites to be shot by officers even though the suspects were armed or violent. An analysis of the Washington Post’s Police Shooting Database and of Federal Crime Statistics reveals that fully twelve percent of all whites and Hispanics who die of homicide are killed by cops. By contrast, only four percent of black homicide victims are killed by cops. But isn’t it a sign of bias that blacks make up 26% of police-shooting victims, but only 13% of the national population? It is not, and common sense suggests why. Police shootings occur more frequently where officers confront armed or violently resisting suspects. Those suspects are disproportionately black. According to the most recent study by the Department of Justice, although blacks were only about 15% of the population in the 75 largest counties in the US, they were charged with 62% of all robberies, 57% of murders and 45% of assaults. In New York City, blacks commit over three-quarters of all shootings, though they are only 23% of the city’s population. Whites, by contrast, commit under 2% of all shootings in the city, though they are 34% of the population. New York’s crime disparities are repeated in virtually every racially diverse city in America. The real problem facing inner-city black communities today is not the police but criminals. In 2014, over 6,000 blacks were murdered, more than all white and Hispanic homicide victims combined. Who is killing them? Not the police, and not white civilians, but other blacks. In fact, a police officer is eighteen and a half times more likely to be killed by a black male than an unarmed black male is to be killed by a police officer. If the police ended all use of lethal force tomorrow, it would have a negligible impact on the black death-by-homicide rate. In Chicago, through just the first six-and-a-half months of 2016, over 2,300 people were shot. That’s a shooting an hour during some weekends. The vast majority of the victims were black. During this same period, the Chicago police shot 12 people, all armed and dangerous. That’s one half of one percent of all shootings. There is no government agency more dedicated to the proposition that black lives matter than the police. The proactive policing revolution that began in the mid-1990s has dramatically brought down the inner-city murder rate and saved tens of thousands of black lives. Unfortunately, that crime decline is now in jeopardy. As I write in my book, The War on Cops, police officers are backing off of proactive policing in black neighborhoods thanks to the false narrative that police officers are infected with homicidal bias. As a result, violent crime is going up, in cities with large black populations, homicides in 2015 rose anywhere from 54% in Washington DC to 90% in Cleveland. Overall, in the nation’s 56 largest cities, homicides in 2015 rose 17%, a nearly unprecedented one year spike. Many law-abiding residents of high-crime areas beg the police to maintain order — precisely the type of policing that the ACLU, progressive politicians, and the Obama Justice Department denounce as racist. This is tragic because when the police refrain from proactive policing, black lives are lost. Lost because of a myth. The best research and data reach this conclusion: there is no evidence that police are killing blacks just because they are black. You now have the truth. Does it matter? I’m Heather MacDonald of the Manhattan Institute for Prager University.